The slightly oddly named HTC J Butterfly has been announced in Japan, sporting a deliciously high-res 5-inch display. The original HTC J launched in Japan earlier this year, sporting a 4.3-inch qHD display, and the J Butterfly builds on this substantially, boasting an impressive Super LCD 3, 5-inch display with a staggering 1080 x 1920 resolution. That display, with its 440ppi density, puts the Retina Display on the iPhone 5 to shame, as it can only muster 640 x 1136 at 326ppi, while its big screened rival, the Samsung Galaxy Note 2, may want to go into hiding with its 5.5-inch display at 720 x 1280. It's not all about the big screen though, the HTC J Butterfly also has impressive specs under the hood, with a 1.5GHz quad-core processor backed up by 2GB of RAM, which will make mincemeat of the Android 4.1 Jelly Bean OS which has been slapped onto the phone. Round the back there's an 8MP camera capable of recording 1080p video, while the front facing snapper offers up a 2.1MP sensor, and Wi-Fi, Bluetooth 4.0, 4G support and a microSD slot will keep you connected. The real issue with the J Butterfly is bound to be battery life. HTC has plonked a 2,200mAh juice pack into the handset, which is larger than most of its rivals, but we can still see that huge screen eating through it before the day is out. 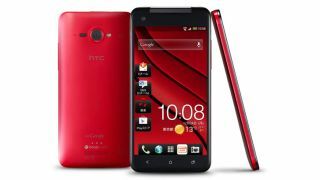 The UK and US HTC J Butterfly release date and price are currently unknown, as the Taiwanese firm hasn't mentioned which regions it will be shipping the flagship handset to, other than Japan. We've contacted HTC about the J Butterfly and possible other territory releases, and we'll update this article once we hear back.